The MeoStar S2 82 HD Spotting Scope from Meopta is a technologically advanced Porro spotting scope and a precision long-distance observation instrument. The straight eyepiece socket allows faster target acquisition and an easier follow of moving objects. The multi-coatings, which are proprietary MB5501TM ion assisted, deliver an exceptionally bright image. The exceptionally sized 82mm objective lens boasts extra-low dispersion glass, a two-part fluoride element, and high-definition (HD) resolution, providing increased contrast and vivid color fidelity while eliminating chromatic aberration. An oversized, silky smooth, central drive makes focusing easy, even when wearing thick gloves. The internal magnesium chassis keeps the scope lightweight and strong. A quick-release bayonet mount allows rapid eyepiece changes with the push of a button and an integrated lens shade reduces glare in challenging light conditions. 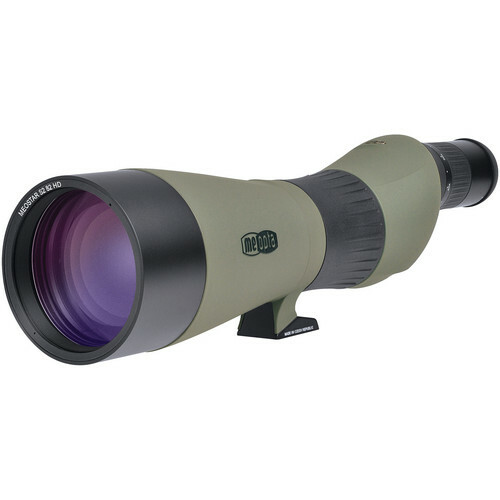 For birders and nature lovers, the MeoStar S2 82 HD will deliver bright, precise images from incredible distances. Box Dimensions (LxWxH) 17.0 x 6.0 x 5.7"